This beautiful flag from the American Centennial in 1876 is one of the few 38 star flags that are undoubtedly made to celebrate the event. Aside from the fact that flags in the medallion pattern are very rare and highly sought after, this flag features several traits that are very uncommon among homemade flags of the period. The flag was made in Albany, New York by Ms. A. Whipple. 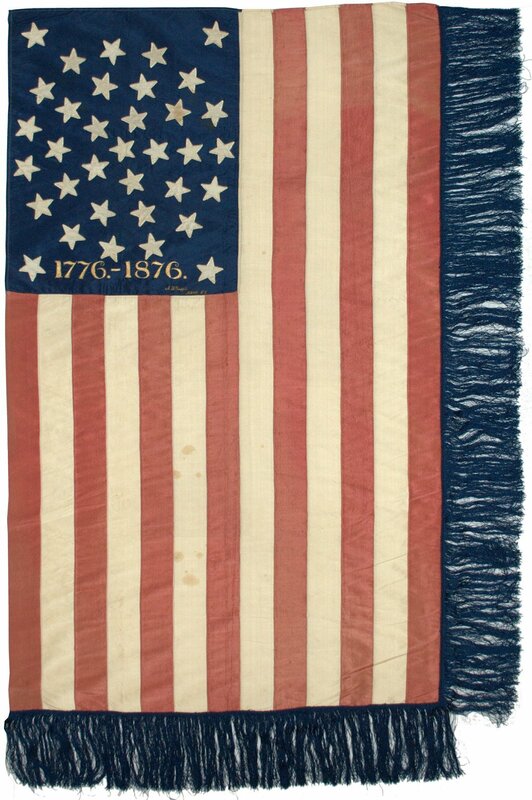 Ms. Whipple embroidered the flag in gold silk thread "A. Whipple, Albany N.Y." It's clear from the impeccable construction of the flag that Ms. Whipple was an expert seamstress. The entire flag is made of hand sewn silk. The even width of the stripes, precision stitching, and extremely fine and beautiful embroider is all evidence of her expertise. Looking closely, you can see that the medallion pattern is especially symmetrical, with five spokes radiating from the center star and three stars in triangular configurations each nestled into the wedges between the spokes. The flag possesses an unusual trait that is unique among flags in my experience--the stars themselves are not simply stitched to the flag, but are embroidered around their edges, resulting in a beautiful silvery raised edge around each star. 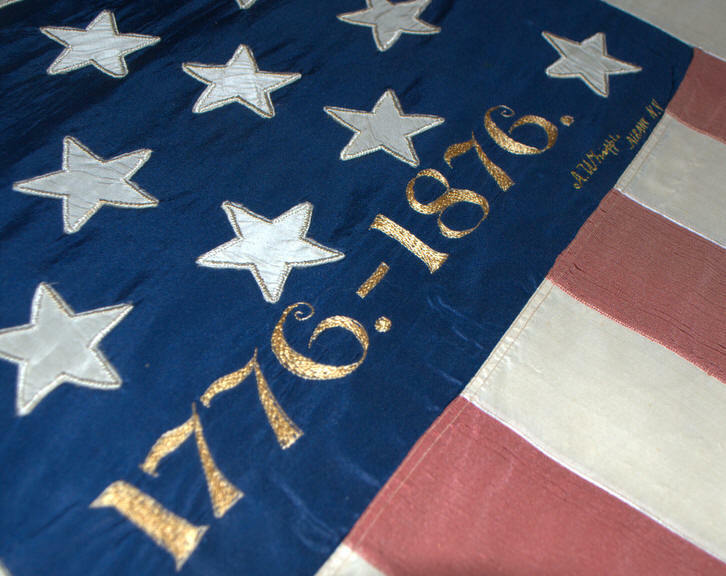 The most striking aspect of the flag, which immediately catches the eye, is the finely embroidered "1776-1876" date. The style of the font is wonderfully attractive and perfectly fits the style of the flag and the period of the American Centennial. The blue silk fringe sewn to the right and bottom edges of the flag are unusual in my experience. The silk threads of the fringe are long, soft and hair-like. The deep navy blue of the silk fringe perfectly matches the deep navy blue of the canton. The flag is single-sided, and meant to be displayed vertically, as shown here. Ms. Whipple apparently added the silk fringe to provide overall balance to the flag, and the effect is unique. Silk flags from this period tend to be very brittle because of the use of weighted silk. It's apparent from handling this flag that it is in fact very delicate, and if it were stressed it could cause splits in the silk. But the flag has been maintained so well for so many years that it is in nearly intact condition despite the fact that it's made of weighted silk, which is remarkable. It's difficult to do this flag justice in pictures, but the photo below provides a stirring glimpse of the patriotic beauty of this flag when seen up close.